When I picked-up a copy of Fannie Flagg's latest book entitled The All-Girl Filling Station's Last Reunion from the store, the saleslady asked me if I'd ever read Flagg's A Redbird Christmas. When I told her I had not, she said that it's one of her favorite Christmas stories, and she rereads it every year during the holidays. Well, I had to find a copy, and I'm so happy I did! I must admit that I enjoy Fannie Flagg's books. Fried Green Tomatoes at the Whistle Stop Cafe is one of my all-time favorites, and not just because of the Alabama setting. A Redbird Christmas isn't set in Birmingham, but rather L.A. (that's Lower Alabama)….Baldwin County, to be exact. Baldwin County is located across the bay from Mobile on the Alabama Gulf Coast. Lost River is a sleepy little community with the population of 108, and is practically run by the Mystic Order of the Royal Polka Dots Secret Society, a group of middle aged and senior women who enjoy secretly decorating community Christmas trees and matchmaking. Their rivals in a nearby community are the Polka Dotted Swiss Society. Up in frozen Chicagoland, Oswald T. Campbell has been given a dire diagnosis of emphysema. His doctor doesn't believe that he can handle another Chicago winter and the threat of pneumonia and suggests he head South for his health. An old brochure for a health spa and fishing camp in Lost River, Alabama intrigues him, so he calls the sleepy Alabama town for some information about the spa. 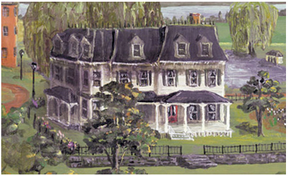 One of the Polka Dots, Frances, answers the phone at the community center and tells him that the spa has been closed for years, but he can find a room to let. Oswald leaves Chicago for L.A. and acclimates well to the climate and culture. He befriends a heart-broken thirty-something grocer with a pet redbird (we call cardinals redbirds in Alabama). The redbird was rescued after young boys shot it a few times with a BB gun, and the little bird becomes the town mascot with his tricks and antics. Preheat oven to 350 degrees. Combine dry ingredients in a large bowl; mix well. Combine water, shortening, molasses, and egg. Mix well, and stir into flour mixture. Pour batter into a greased 9-inch-square pan. Bake for 35 to 40 minutes at 350 degrees, or until a wooden toothpick inserted in center comes out clean. Serve warm with Lemon Sauce. Combine sugar and flour in a small saucepan; mix well. Stir in water, lemon juice, and salt until smooth. Bring to a boil over medium heat, stirring constantly until sugar melts. Reduce heat and boil gently 1 minute. Remove from heat and whisk in butter, 1 tablespoon at a time. Serve warm or at room temperature. I crosshatched the top of the bread so the lemon sauce could be pored into the bread. I was skeptical about the lemon sauce, but it was fantastic on the gingerbread. Both should be served warm. I also thought I'd participate in Freda's Friday 56 @ Freda's Voice. 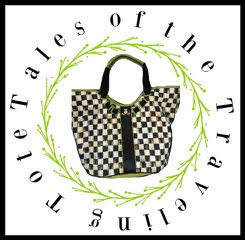 Frances, trying to be tactful, said, "Well...he's a cute little man, with cute little teeth, and of ourse he has that funny accent and..."
Frances laughed in spite of herself. :He looks like an elf." Have you read any Christmas books you'd like to share with us? 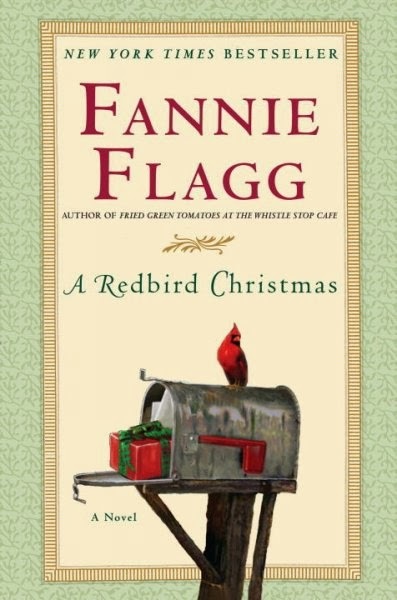 I've read A Redbird Christmas and enjoyed it, in fact I've read all of Fannie Flagg's books. Her last book though I was a little disappointed in, I even forget the title of it. I hope you review her newest one after you read it because if you say it's a good read I'll buy it for sure. I recently added the All-Girl book to my TBR pile, but it sounds as if I have to find Redbird! Your place setting is beautiful. The gingerbread looks yummy! It's interesting to know that the lemon sauce actually goes with the gingerbread. We usually read traditional books like a Christmas Carol, Miracle on 34 St. ( it's actually a novella), and the children's Christmas books. However I have a Madeleine Engle Christmas book that I love and read almost every year, and this post reminds me to find it. I took off our main shelves of our house, because I didn't want it borrowed or misplaced by anyone. It might be available now, but a few years ago I couldn't even find it on Amazon. Gingerbread recipe!!!!! -clapping hands- My 15 year old Granddaughter's boy friend, loves Gingerbread. I want to make him a pan of it. But do not have a recipe. Weeeeee.... YOU have posted one! What a coincidence! I have a gingerbread in the oven right now. I used the Joy of Cooking recipe. Hope mine turns out as luscious looking as yours! You have read my mine. I am looking for more gingerbread recipes and I am going to copy this one done. Thanks, it looks good. Gingerbread cake with lemon is my total favourite. I think that I could have this everyday. Thanks so much! I love her stories, but I'd never heard of this one (which is now on the top of my library list). Yay! That cake and lemon sauce looks delish! Sounds like a sweet novel! I do love a book with recipes! Sounds good and a great 56! Have a great weekend! This sounds like a very touching story. I am definitely going to have to read this one. Oh my gosh, this Gingerbread with the lemon sauce looks amazing. I love Gingerbread, especially at this time of year. Enjoy the season, Ricki Jill! Hi Ricki Jill, I've read Redbird Christmas, what a sweet story made a little sweeter with a little baking fun! The lemon sauce sounds wonderful with the warm gingerbread! Oh, the gingerbread looks delicious! I've not read Fannie Flagg before, but there are so many of her books I want to try. The Christmas story sounds wonderful.